Introduction. List of Frequent Symbols. I. Abstract Convex Structures. Basic concepts. The Hull operator. Half-spaces and separation. Interval spaces. Base-point orders. Modular spaces. Bryant-Webster spaces. II. Convex Invariants. Classical convex invariants. Invariants and product spaces. Invariants in other constructions. Infinite combinatorics. Tverberg numbers. III. Topological Convex Structures. Topology and convexity on the same set. Continuity of the Hull operator. Uniform convex structures. Topo-convex separation. Intrinsic topology. IV. Miscellaneous. Embedding Bryant-Webster spaces into vector spaces. Extremality, pseudo-boundary and pseudo-interior. Continuous selection. Dimension theory. Dimension and convex invariants. Fixed points. 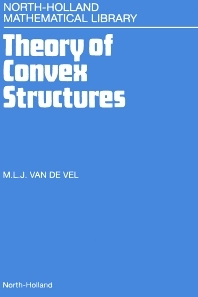 Presented in this monograph is the current state-of-the-art in the theory of convex structures. The notion of convexity covered here is considerably broader than the classic one; specifically, it is not restricted to the context of vector spaces. Classical concepts of order-convex sets (Birkhoff) and of geodesically convex sets (Menger) are directly inspired by intuition; they go back to the first half of this century. An axiomatic approach started to develop in the early Fifties. The author became attracted to it in the mid-Seventies, resulting in the present volume, in which graphs appear side-by-side with Banach spaces, classical geometry with matroids, and ordered sets with metric spaces. A wide variety of results has been included (ranging for instance from the area of partition calculus to that of continuous selection). The tools involved are borrowed from areas ranging from discrete mathematics to infinite-dimensional topology. Although addressed primarily to the researcher, parts of this monograph can be used as a basis for a well-balanced, one-semester graduate course.